In August, 1999, Greg and Tammy Guite started Elite Carriers LLC with four company owned trucks and three owner operators. For the first 3 ½ years the business was operated out of their home with all business meetings and driver orientations handled at their kitchen table. The maintenance shop operated in a single truck bay at a different location. 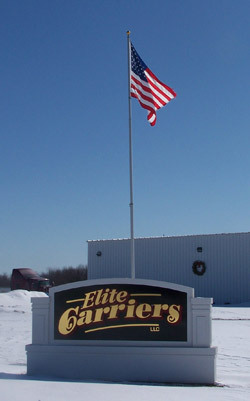 In April 2003, Elite Carriers moved to a new building located in the Town of Wausau. This building served Elite Carriers well for 10 years before Elite Carriers expanded yet again in December 2013 by moving into a new building located at N1545 County Road W in Merrill. This building increased the office space to 18,000 sq ft and shop space to 46,000 sq ft. It also features a driver training center, driver lounge, employee cafe, 16 truck and trailer bays, a parts room, two wash bays, and two docks. The building is visible and easily accessible from I-39. As of September 2017, Elite Carriers has grown to 84 company owned tractors, 8 owner operators, over 80 employees, and more than 300 dry van trailers.